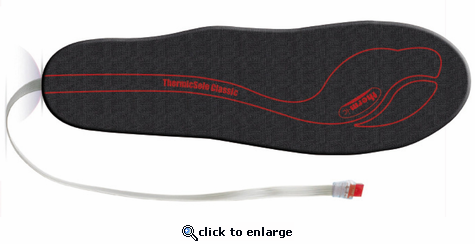 Therm-ic Classic insoles are flat insoles with a pre-installed heating element built into the toe area. All you do is trim the insoles to the size you require, slide them into your shoes or boots and plug in your battery to enjoy warm feet. You'll receive 2 insoles that are about 1/8 inch thick.